Singing the Ethos of God is a meditation on an interconnected set of problems modern western Christians encounter when trying to bring Scripture to bear on the moral questions of the day. My sense that such a book needed to be written crystallized in an Oxford seminar on the use of the Bible in Christian ethics. In that seminar several world-class biblical scholars and moral theologians gathered with a room full of the English-speaking world’s future pastors and academic theologians, attempting to discern the ethical implications of a few classic biblical passages. The results were disastrous. Occasional flashes of insight emerged, but the participants were left with the overwhelming impression that so much complicated critical machinery has been interposed between us and Scripture that we (i.e., primarily academically trained theologians) no longer have the skills to handle it directly. For a post-Reformation church founded on the claim of sola scriptura, to be in such a state seemed a highly problematic state of affairs. Adding insult to injury, when I went to biblical commentaries to see if they had anything to bring to the discussion of contemporary ethical questions, I found little of value. The conclusion seemed inevitable: the way we conceive our relationship to Scripture makes it difficult, if not impossible, both to discern the ethical implications of biblical texts and to do so in an academically respectable manner. This set me thinking, and more importantly, reading. Along the way I discovered that the great theologians who sustained and enriched Christian faith not only could and did read Scripture directly and theologically, but their thinking about contentious moral questions often took the form of biblical commentary. They could do so, in large part, because they so regularly practiced the art of theological commentary. Aquinas, for instance, lectured almost exclusively in the form of biblical commentary. Calvin lectured or preached on Scripture at least one hour every single day. Because modern Christians know only the Summa Theologiae or the Institutes, we have lost sight of the vast intellectual effort these scholars poured into direct biblical commentary, and how it formed their theologizing. The same can be said of almost all of the great western theologians. I found this fact and its contemporary eclipse striking. The more I looked into it, the clearer it became that these great biblical interpreters had much to teach modern Christians. I decided that the best way to bring this tradition back into view was simply to show the masters at work. 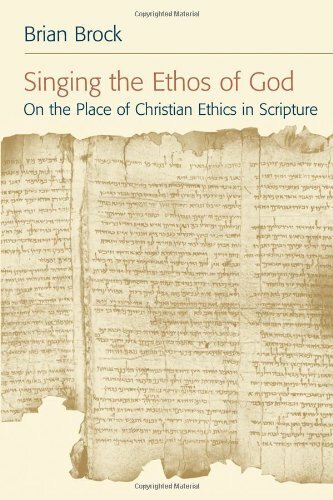 Thus, the main section of Singing the Ethos of God follows Augustine, and then, Luther as they comment on and draw out the ethical implications of the Psalms. The first part of the book prepares the reader to appreciate how they read Scripture by surveying a wide range of contemporary accounts of the relation of Christian ethics to the Bible. This discussion raises a set of questions about modern hermeneutic presuppositions and practices to which Augustine and Luther turn out to be well-equipped to respond. Why the Psalms? As I delved into the tradition of Christian biblical interpretation I discovered that this biblical book played a special role for Christians down through the ages. It was the book that they lived with daily, and trained them to praise God collectively and speak to God individually. Singing the Ethos of God asks what it means that contemporary Protestants are no longer so directly tied to this tradition of intense performative contact with Scripture, and often are not familiar with the content of the Psalter. Brian Brock, Singing the Ethos of God (2007). This question proved especially useful in thinking about the role of Scripture in Christian ethics. The close relationship of our foremothers and fathers in faith to the Psalter suggests that in important respects their faith had quite different contours. By comparison, modern faith is more oriented by the Enlightenment’s focus on faith as a belief in content derived from Scripture, rather than faith as a response of praise for God’s graceful working. My main finding is that of all biblical books, the Psalter is particularly suited to reorient contemporary understandings of the relationship of Scripture and Christian ethics because it holds together talk about God and talk to God. It demands that theology be prayerful, prayer be theological, and both be trained in the school of Scripture. Luther called the Psalter a primer in teaching believers what to feel, in so doing attaching faith anew to God and his works in the world. This is not to suggest that the Psalms lend Christian faith only a new subjective orientation in distinction from anything we might think of as traditional external and objective moral claims. But in emphasizing the centrality of our locatedness as moral actors, the Psalms take a very different approach to defining what properly constitutes a moral claim. For the psalmists, the proof that one has meditated on and been incorporated into the life of the people of God is the bearing of “fruit in season” (Ps 1:3)—timely and appropriate good works. The Psalter, by giving us the words to talk to God, and by reorienting our affections, therefore sets out a deep challenge to the most common modern accounts of Christian ethics which look to extract “timeless” moral truths that can then be “applied” to the circumstances of our lives. For the Psalmists, faith looks very different. Faith is the exploratory testing of God’s promises in Scripture. For them (as for Augustine and Luther) human action is the expression of what we love, and the Psalter is the biblical book supplied by God for Christians to perform in order to reorient the loves they have inherited from the world. Modern Christians, especially Protestants, tend to think of doxology as a discreet activity or portion of the worship service. The result is that in academic contexts doxology, if discussed at all, appears in the context of liturgics courses. As such it stands far removed from ethics. In academic contexts, Christian ethics, in those places where it is understood as drawing on Scripture, thus takes place in a very different intellectual atmosphere. That atmosphere is almost always marked by lengthy discussions of hermeneutics. Hermeneutics is a popular terms these days, and when applied to Scripture in the context of courses on Christian ethics, usually covers questions about how a text that grew out of a misty and very different ethical world can be relevant for today’s ethical deliberations. But in the Psalms such questions evaporate, to the benefit of contemporary Christians. Singing the Ethos of God ends with my own attempt to practice what I have preached regarding the performance of the Psalms. Having argued that every generation of Christians must become theological interpreters of Scripture, I conclude the book by taking the whole question of the role of Scripture in Christian ethics to the Psalms. I look in some detail at Pss 130 and 104, discovering that they train believers to cooperate with the source and form of Christian faith, indicating how this faith opens us to life in the body of Christ. In this body our differences are transformed by the redeeming God, and with them the cultures we inhabit. By asking what it means to perform the Psalter, those Scriptures designed to be sung together by the body of Christ, the terms of our debates about the role of the Bible in Christian ethics are reformulated. Under its tutelage we can no longer ask how to use the Bible in Christian ethics, but must ask a new and unsettling question: how does Scripture reformulate our definitions of Christian ethics? Singing the Ethos of God asks this question from within both church and academy with the aim of letting the sharp edges of Scripture serve afresh the God who is carving a new creation out of a rebellious world.